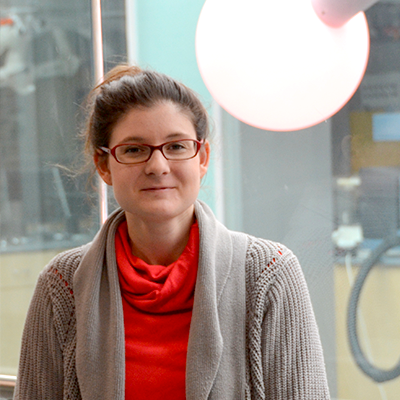 That constant change is what motivates materials scientist Lauren Zarzar in her research. Zarzar received her Ph.D. in chemistry from Harvard in 2013 and joins Penn State after completing her postdoctoral work at MIT, where she focused her research on dynamic materials that sense and adapt to their surroundings—in particular, microscale materials that move in response to a stimulus such as a change in temperature, pH, or humidity. When Zarzar began thinking about using laser lithography to deposit metals, she was interested in using platinum because platinum is a catalyst—a substance that increases the rate of a chemical reaction but doesn’t itself undergo a permanent chemical change. She had the idea to create a three-dimensional active structure (a pump, in this case) by causing platinum to interact with a hydrogen peroxide solution. In initial experiments, when Zarzar deposited the platinum with a light-induced process, she noticed that when the laser light hit the platinum, the surrounding solution would heat up quickly, allowing her to induce new reactions. Next steps in her research will involve exploring a thermal approach in the direct depositing process as well as depositing materials other than platinum. Direct depositing of metals and oxides has potential applications for direct-write circuits, sensors, catalysts, and electrodes. Emulsification, Zarzar explains, is a well-known and powerful technique for mixing and dispersing components through liquid, and emulsions are critical components of many medicines and foods. Complex emulsion properties and functions are related to the droplet structure and are becoming increasingly important in pharmaceuticals and medical diagnostics, cosmetics, and optics. Zarzar and her husband moved to the State College area from Cambridge during the summer, and she began her position with Penn State on August 1. Her husband, whom she met at Harvard during graduate school, is a lecturer in the Department of Chemistry and involved in developing chemistry courses for Penn State World Campus. “Penn State was a good fit for both of us,” she says. During fall semester, Zarzar is busy setting up her lab and training two graduate students and one undergraduate. She’ll begin teaching the undergraduate course Introduction to Polymer Materials during spring semester. She was recently named the Virginia S. and Philip L. Walker Jr. Faculty Fellow in Materials Science and Engineering.